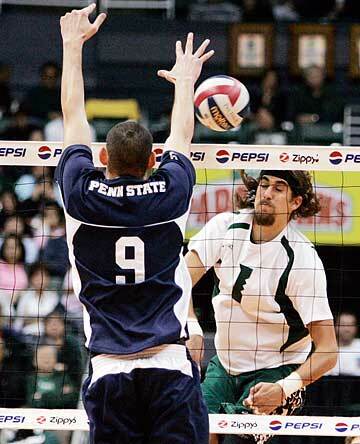 Matt Rawson of Hawaii was fifth in the MPSF in blocking as a freshman and is one of the program's building blocks. Saturday's season-ending loss to UC Irvine had Hawaii (13-14) finishing below .500 for the first time since 1992, the year before Mike Wilton took over the Warriors volleyball program. That Hawaii got to .500 during the regular season via a 10-match winning streak impressed even Saturday's opposing coach, the Anteaters' John Speraw. "All any coach wants is for his team to be playing the best volleyball at the end of the year and Mike did that," Speraw said. "He did a wonderful job of keeping the guys together this year. When they were 3-13, the wheels could have fallen off. "I was really impressed with what he said after they lost to us to open the season. 'We're a good team, I like my guys, I believe in my guys and we can make this happen.' In the end, he was right. I'm happy that Lauri (Hakala) played as well as he did in his final match, and Brian (Beckwith) and Dio (Dante) had great final matches. It's a tribute to them how well they played in their final match." Hakala, Beckwith, Dante and Eric Kalima finished their careers Saturday, leaving behind a young team laden with talent, potential and question marks. Lauri Hakala put down 831 kills in three seasons. But it was his parting shot off the court that may have been his best. It's the All-American's belief in the future of the program. "This team is going to be good next year and it's going to be really good two years from now," said Hakala, one of four Hawaii seniors -- all starters -- who ended their careers with Saturday's five-game loss at UC Irvine. The Warriors lose a lot with this senior class, from the best blocking setter in the program in Brian Beckwith to the best blocker in the Mountain Pacific Sports Federation this season in middle Dio Dante. Also gone will be the co-captains: Hakala, the team's kill leader and the focus of all opponents' game plans; and Eric Kalima, the "local boy makes good" inspirational leader, playing on bad knees, giving everything he had to help the team succeed, whether from the bench, at libero or at outside hitter. Likely also to be gone is junior middle Kyle Klinger, whose brief sabbatical this year to rethink his commitment to the sport may be permanent. And there's always a possibility of losses over the summer -- Coach Mike Wilton says he never truly knows who'll be back until the first day of fall camp -- but, besides Klinger, all underclassmen are expected to return. There will also be newcomers thrown into the fight for starting positions next season, beginning with 6-foot-1 setter Sam Morehouse from Wilson High in Long Beach, Calif., who signed earlier this month. There may also be two foreign players in fall, whose paperwork is pending. Add the unnamed but anticipated numerous walk-ons, mostly island prep products, and the fall number will swell into the 30s. Should Klinger leave, Hawaii will have just one senior in 2008 in Jake Schkud, a middle trying to make the transition to outside hitter. The class of 2009 has only hitter Jim Clar, setter/hitter Sean Carney and lightly used libero Mikey China. "We'll have a really young team next year," said freshman hitter Matt Vanzant, a starter for 19 matches who finished second behind Hakala in kills. "I'm looking forward to the next couple of years. We're going to be able to play together for a little so we'll be more of a team. "There's a lot of potential for the next couple years." Hawaii was able to turn around a potentially devastating season into one that had the Warriors a few plays away from making Thursday's MPSF semifinal against BYU. Instead it will be UCI, the team that opened and closed Hawaii's season with losses. Although the Warriors did finish with their first sub-.500 season in Wilton's 15 years, they rode a 10-match winning streak into the playoffs, seeded No. 6. "I guarantee that Games 1 and 2 (Saturday) were the best games they played all season," UCI coach John Speraw said after the match. "Hawaii played phenomenal volleyball." It's a memory the returnees want and need to retain, to build on for next season. "We have a lot of hard work to do this summer and during the preseason," starting freshman middle Matt Rawson said. "The disappointing thing is we came out, did our thing the first two games, thought it (winning) was going to happen. We started playing a little relaxed and (UCI) came back. "Next year, we will have a little more experience." Hawaii's building blocks are Rawson, fifth in the MPSF in blocking, and libero Ric Cervantes, both of whom got better and better as the season progressed. After Saturday's match, Speraw told Cervantes' dad, Victor, that Ric had been doing such a good job at passing the Anteaters' serves that they quit serving him. Saturday was somewhat a deja vu experience for Ric Cervantes, a freshman at Santa Barbara High when brother Cole was a senior. In the CIF semifinals, the Dons also lost the match late after controlling early. "Just like I wanted it for my brother, I wanted our seniors to go out on top," Cervantes said. Cervantes, China and redshirt freshman Justin Ching are the known libero candidates for next season. But as happened this season, when Kalima was moved to libero for a while, anything can happen in Wilton's cauldron system, where players earn points during practice toward playing time. "Everyone will go back into the bowl, and whoever comes out the best will play," associate coach Tino Reyes said. "It gives opportunities to everyone to see where they might help us." Carney is a case in point. The reserve setter is also being looked at as an outside hitter, just one of several players on the roster who could end up in another position next season. Freshman Steven Grgas, a 6-7 opposite, is being trained for a middle spot. Wilton likes the athleticism of redshirt freshman Josh Walker, a 6-2 hitter, but isn't sure where he fits in. Redshirt freshman middle Keali'i Frank has size (6-6), redshirt freshman setter Nejc Zemljak has international experience. The only thing that is a given is what Hawaii loses in Beckwith, No. 3 in career assists (4,509); Dante, No. 2 in career block assists (406); Hakala, a terminator (4.35 kpg, 25 aces); and Kalima, who led the team in digs (229) and bruises.